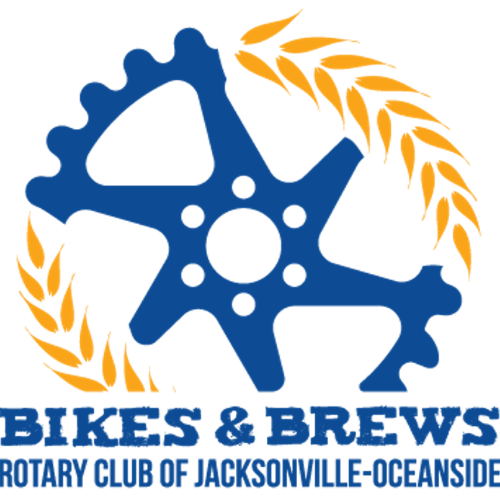 The Rotary Club of Jacksonville-Oceanside, will present the first annual “Bikes & Brews” event to raise funds for and awareness of their community-wide bike rack program. Additionally, the event will feature the outstanding local micro-breweries and beer purveyors in the Beaches community as well as local history. The event will be a combination pub crawl and scavenger hunt with participants encouraged to ride their bikes to each location. The event will begin at Really Good Beer Stop and end with a party at Green Room. Details: Ticket prices $25 and will include a small pint-style glass and one complimentary sample at each participating brewery. So, do I have to ride a bike? No, but I mean, it’s in the name and you won’t have to look for a parking spot! C’mon, just do it, it’ll be fun! Please cross at intersections and obey traffic laws! I’m super out of shape, can I still participate? The total course is about 4 miles. You can go as slow or fast as you want and you’ll have lots of stops in between and you can take as long as you like, just make it to the party by 4 for the drawing! Show up at Really Good Beer Stop any time between 1pm and 2pm. Grab your mug and scavenger hunt card and get on your way! Spoiler alert, we’ll end at Green Room, just in case you need to plan ahead! It’s not a race BUT, if you complete your scavenger hunt card, you’ll be entered to win fabulous prizes! Believe me, you’ll want a chance to win these fabulous prizes! The prize drawing will be at 4pm. Every location allows children at the times that we’ll be there. So, if you think your toddler will bring a little something special to the party, bring ‘em on! There are 4 beer stops and you’ll get one 5 oz. pour at each. You can buy more if you’d like but don’t forget to stay on course and definitely don’t forget to tip your bartenders! Well, it’ll probably be nice and refreshing on a hot day! This event will be rain or shine BUT if there are thunderstorms in the area, the event committee will either postpone or shorten the event and will communicate to attendees via email and the Facebook Event. What should I know that I forgot to ask? Good question, we have no idea. This is a first year event so we look forward to learning right along with you! Please be patient with us and enjoy this FUN event for a great cause—the Rotary Club of Jacksonville—Oceanside’s Bike Rack program!